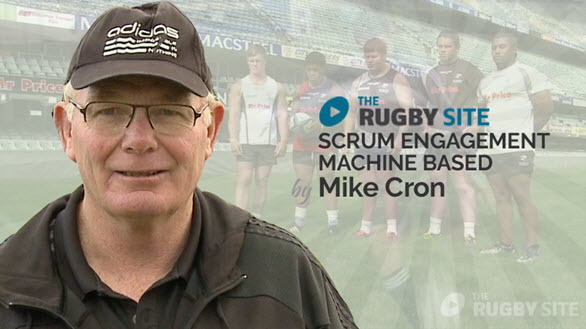 Recognised as the leading scrum in world rugby, The All Blacks guru Mike Cron delivers in his unique style all the tricks which have kept him a part of the All Blacks coaching environment for over a decade. Excellent presentation with practical techniques that can be implemented immediately. Simply put, MAGNIFICENT!! Thank you for emparting your wealth of knowledge. Do you need another comment of praise? Probably not. But you’re getting one. That was brilliant! This is so helpful, great technique and well explained. OK. So this programme with centring makes “sense” of the Profile or Tower of Power. It gives it energy, resonance, strength, power. Then together in the scrum you can create a locked synergy which turns ordinary into extraordinary. This season we took our disjointed U13s forwards through this whole set up, building these values in and repeating it over and over. They have just won the Devon U13s Cup on a windy rainy afternoon against much bigger teams two of whom beat them massively at the start of the season. It works. Brilliant, as usual, I Watch it regularly, so I do not forget. Could we get a quick new video of the best way to set up with the new engagement laws? Body position stays the same, but the initial set up is different with the bind instead of the touch pause. Love the detail in this video, but as a trainer I completely disagree with forcing an anterior pelvic tilt before loading your spine. The safest and strongest point for your spine is neutral. To force hyper extension is actually weakening your spine. You need to encourage your players to find a neutral spine and then engage their core as they crouch to be able to maintain it while in scrum position. Excellent video from a legend. Very good video, but does this set-up still apply for the new scrum laws and sequence? Excellent video for anyone looking to get a consistent approach to scrummaging with their team. The attention to detail is spot on and the delivery is straight forward and easily applicable to all levels of the game. This is precious knowledge from a legend. One of the most educational rugby videos I have seen. Great job. My son is 9 and just starting out as tighthead prop. It’s his first year playing rugby and this is a must for body positioning…Great Stuff! Currently planning a scrum fundamentals lesson and this is incredibly helpful. I’ll agree with Charles and say I wish I’d had this stuff back in the school days… And with Ian about getting more Cron!!! Awesome. Brilliant techniques to get body positions sorted! More Mike Cron please!! This is excellent and his delivery is spot on, he has the guys attention and they clearly learned a great deal. I have heard a lot about the legendary Mike Cron’s coaching techniques. I wish that I had bought this video a lot earlier in my coaching days. It is an excellent video with attention to detail and I can recommend it to all forwards’ coaches. Over time I have built up a library of books and videos about various different topics. This video of Mike Cron rates as one of the best per category. I’ll definitely put it to good use.